Days/Times: Mondays or Wednesdays: 4:00-5:00 p.m.
Days/Times: Boys - Thursdays: 4:00-5:00 p.m. or 5:00-6:00 p.m. Girls - Tuesdays: 4:00-5:00 p.m. or 5:00-6:00 p.m.
Days/Times: Boys - Mondays: 4:00-5:00 p.m. | Thursdays: 4:00-5:00 p.m. or 5:00-6:00 p.m. Girls - Tuesdays: 3:00-4:00 p.m. or 4:00-5:00 p.m. 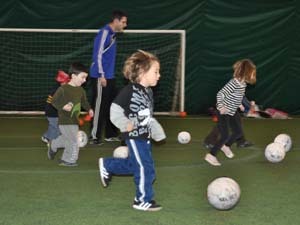 Experience your toddler's first soccer class as you guide them through the games and scrimmages presented by our coach. With a parent participating by their side, kids will learn the fundamental skills of soccer in a fun way. Sessions are structured to encourage participation and designed to stimulate a child's imagination and develop their motor skills. Developed for your future star, this 45-minute program features drills, races, and games that build coordination, teamwork, confidence, and love of the game. In addition, our participants love the fun themes we incorporate into the program. From pirates to Star Wars, it's a new experience every week. 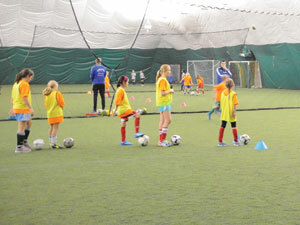 This clinic provides the perfect venue for boys and girls to learn soccer fundamentals and increase their agility. Players focus on passing, ball control, finishing, first touch, and speed dribbling through drills and games. They also learn the importance of teamwork and sportsmanship. Structured games and fun small-sided scrimmages are part of each class. Offering position-specific training for goalkeepers, this clinic focuses on fundamental skills such as movement and agility, handling, diving, one-on-ones, and distribution. The course is taught by Stuart Smith, who has 10 years of experience providing private and group instruction to youth goalkeepers. Stuart is certified with the Regional and National Goalkeepers Diploma from the NSCAA. This clinic is designed to help players develop more powerful and accurate shooting technique. NSCAA Premier level coach Stuart Smith will improve each player's ability to score goals. This clinic is designed to improve the skills of travel soccer players who already have an understanding of basic techniques. Our coaches follow a progressive curriculum designed specifically for each age group. Each class includes technical development of foot skills, dribbling, passing, and shooting, followed by small-sided gameplay.